donations to RCHFH can be used to build houses for low-income families! Doors – We accept doors in GOOD condition. They must not have cracks, rot, or water damage. Flooring material -We accept tile, hardwood, and vinyl. All must be new/never installed in quantities of at least 3 boxes. We will accept only new carpet. Furniture -All furniture must be in good condition, no rips, tears or stains, and must come from smoke-free home. Hardware – We accept hardware for doors, cabinets, gates, etc. Kitchen/Bathroom Cabinets– Up-to-date and not damaged. They must have doors, shelving, display racks, etc. Lighting – We accept most light fixtures. Must have mounting bracket. Lumber Plywood Sheetrock Trim– We accept full and 1/2 sheets of plywood. We accept only full lengths of lumber and trim. Please, no rot or nails. Miscellaneous – Domestic/home framed artwork, decorative accent items, collectibles, antiques. Office Furniture -We take credenzas, file cabinets and chairs. No partitions or cubicles. Paint – 3/4 Full cans of water base paint only. Roofing Material – We accept all types of roofing material such as rolled roofing material, metal roofing, and (3) or more, bundles of new shingles. Tubs Sinks Showers Toilets – We accept tubs and sinks (no faucets or plumbing, no cultured marble tops w/out cabinet) if they are in good condition and clean. We accept commodes. They must be very clean!! Tools – We accept all hand tools in working condition. Windows – We accept vinyl DOUBLE PANE windows, wood-framed windows for crafting, and faux-wood blinds (no mini blinds or aluminum windows). 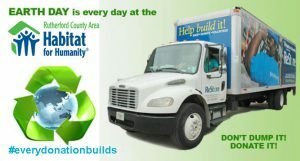 Let us recycle your large new and slightly used items! We pick up large items such as furniture and appliances. Call 615-849-5994 to arrange pickup. Every day is Earth Day at the Habitat ReStore!